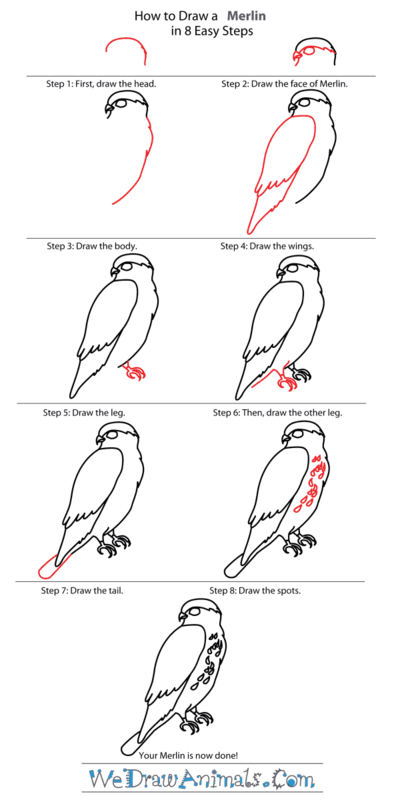 In this quick tutorial you'll learn how to draw a Merlin in 8 easy steps - great for kids and novice artists. At the bottom you can read some interesting facts about the Merlin. 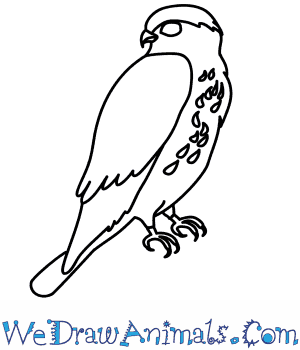 Step 1: The Merlin is a type of falcon that lives in North America and Europe. It is sometimes called a pigeon hawk. 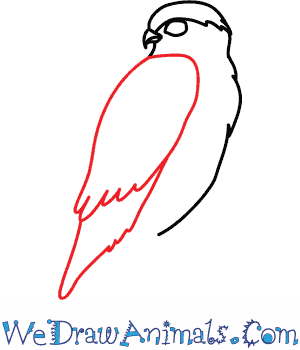 To draw one, start by drawing a short curved line for the top of the merlin’s head. 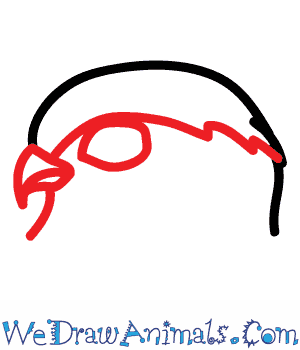 Step 2: Then add a short curved beak. 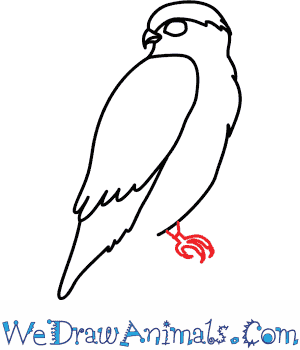 Add a jagged line towards the top of the head for the ‘cap’ of feathers on the merlin’s head. Then draw a small circle for his eye. Step 3: Next, add a slightly jagged line for the merlin’s chest and belly. Step 4: To make the wing, make a long oval that is pointed at the bottom and slightly jagged on one end. 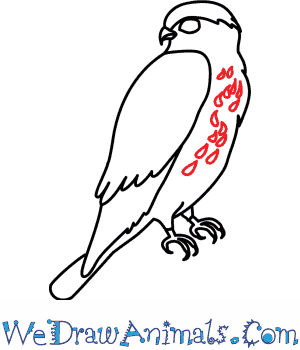 Then add a jagged line down the middle for the feathers. 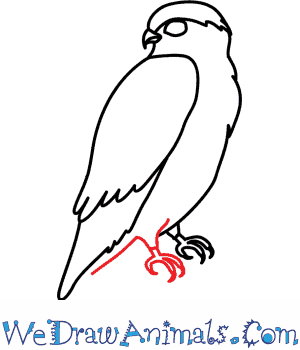 Step 5: Add a small backwards ‘C’ shape for the merlin’s leg. Add a clawed foot. 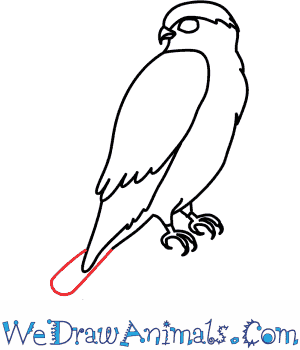 Step 6: Draw another clawed foot and a line that stretches back to make the rest of the merlin’s belly. 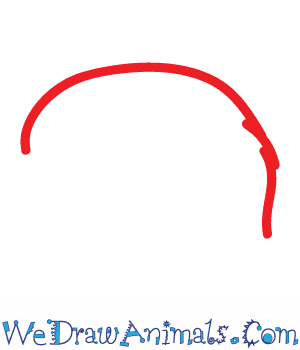 Step 7: Draw a long ‘U’ shape to create the merlin’s tail. 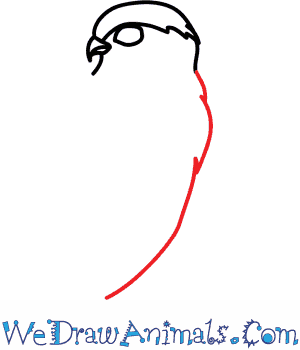 Step 8: Finally, add some circles and ovals to the merlin’s chest to create the patterns of his chest feathers. You’re done! Merlins have white bodies, with brown markings on their chest. Their wings are a blue gray color and their tail feathers are a dark gray or black color. The merlin is a commonly found falcon in Northern America as well as several other countries. Here in North America there are 3 subspecies, but worldwide there are 9 subspecies found. This particular falcon is 9-13 inches in length and has a wing span of 20-29 inches. The merlins are chestnut brown on their backs and white with dark streaks from its throat to its lower belly, with its crown (top of head) and eye line being blue-gray with a bit of yellow. The merlin’s diet is mostly made up of smaller birds, but also includes small mammals, insects, and reptiles. Merlin’s do not build their own nests, they will often find old nests made of sticks to occupy. The female merlin can lay between 3-6 eggs. They do not lay them all at once; it can take 2 days in between each egg. This falcon actually used to be called a “pigeon hawk”. In the Middle Ages merlin were commonly used in falconry, which is the training of birds of prey for hunting. The females and males are easy to tell apart especially side by side as females are considerably larger than the males. The male and female merlin will also work together to make sure their eggs hatch. The male will find a suitable nest and provide food for the female as well as help keep the eggs warm till they are ready to hatch.